Members of Dunnet Forestry Trust have started a small tree nursery in the forest with the help of the local Scout troop. Caithness And Sutherland Trout Angling Group carried out improvements to the banks of a spawning burn at Reay, including tree planting to help stabilise the stream banks. 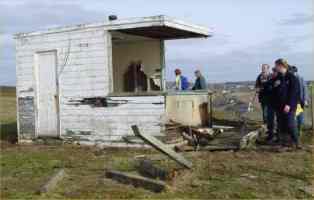 The Lybster Community Council have worked up a project with the Ranger Service to replace the derelict coastguard lookout hut south of the village with a flagstone shelter and interpretive panel to help people watch sea mammals and birds. The Friends of Newtonhill Group, in conjunction with the Caithness Ranger Service, is holding a number of Open Days in Newtonhill Forest, with the aim of finding out about the wildlife that live there. Residents of Ulbster, in association with Yarrows Heritage Trust are undertaking regular visits to the area around Loch Watenan, to observe how plant, bird and invertebrate life changes through the seasons. The project is helping the Achvarasdal Woodland Management Committee print a leaflet on the wildlife and plantlife to be found in the forest. The project has commissioned wildlife and landscape photographers Ken Crossan and Iain Sarjent to take 365 photographs of Caithness to illustrate the area's diverse wildlife, plantlife, landscape and land use. From September 2003, the Caithness Biodiversity Collection will be available, free of charge, for local groups and businesses to use on a not-for-profit basis. Contact Marina Finlayson at the Bruce Buildings, Sinclair Terrace, Wick - Tel 01955 607758 for further information.